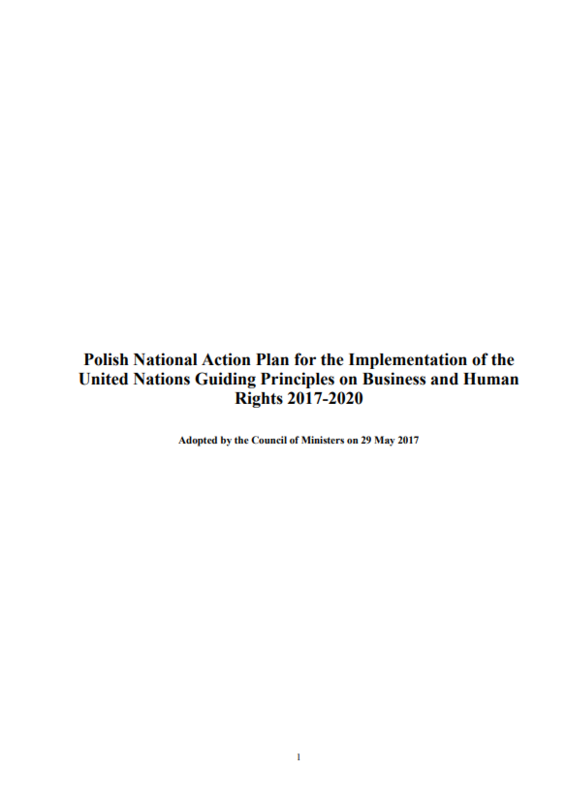 string(1343) "Resource Centre > Uncategorized > Polish National Action Plan for the Implementation of the United Nations Guiding Principles on Business and Human Rights 2017-2020"
The National Action Plan was created on the basis of the three pillars included in the UN Guiding Principles on Business and Human Rights. The National Action Plan primarily aims to enhance the protection of human rights of individuals and to enable them to seek justice when their rights are violated by businesses. By describing the government’s actions to promote corporate social responsibility, as well as referring to strategic documents in this area, the National Action Plan demonstrates a deliberate state policy of supporting businesses while stressing the need for human rights. The Polish National Action Plan makes reference to supply chains in the sections on responsible business conduct and human rights with regards to OECD Guidelines for Multinational Enterprises, dialogues and exchange of knowledge and experience in implementing corporate social responsibility, and in the section devoted to education.